Can Olbermann and Gore Democratize the Media? Can Al Gore's cable channel find an identity now that Keith Olbermann has arrived? Today former MSNBC anchor Keith Olbermann announced that he’s joining Current TV, the cable channel started by Al Gore, as its “chief news officer” and host of a primetime news show. Incidentally, I did an in-depth article about Current TV in 2005 for The Nation, charting its early evolution and growing pains. Gore and his business partner, Joel Hyatt, originally envisioned Current as an attempt to democratize the media through user-generated, grassroots video reports. 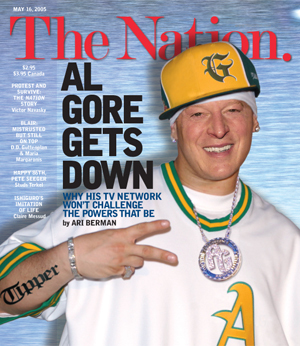 But along the way, that original idea became repacked as slick, MTV-style content trendily aimed at Generation Y.
Interestingly enough, Gore, after initial talks with industry insiders, explicitly rejected the creation of a liberal alternative to Fox News, which in many ways is what Olbermann created at MSNBC. As they queried friends in the industry for advice, Gore and Hyatt kept hearing the same refrain: There is no market on TV for a liberal channel. No one will watch it. No advertiser wants it. No cable operator will put it on the air. So they turned to an emerging demographic that appealed to both advertisers and visionaries. Twentysomethings were defining their buying habits, coming into their own politically and were underserved creatively on television. The decision was made to launch a youth network. Media critic Douglas Rushkoff pushed the vice president to embrace what he termed MoveOn.org in prime time: TV that could make civic affairs cool. But Current largely eschewed that route and has been in an identity crisis ever since, caught between the whims of youth culture and a desire to do substantive TV. At MSNBC, Olbermann proved there was a market for liberal news and civic affairs done in a confrontational, fast-paced way. “Nothing is more vital to a free America than a free media, and nothing is more vital to my concept of a free media than news produced independently of corporate interference,” Olbermann said today. Perhaps Keith’s arrival will allow Gore to do what he’d initially envisioned all along.